If you wanted to design an augmented reality app, but didn’t have programming expertise, what would you do? Last fall, two graduate students, Felipe Cruz (now, Dr. Cruz), Keith Leisner, and Deb Streusand began working on Raugmenter in the DWRL. This tool was designed to make the augmented reality platform LayAR accessible for people who aren’t developers. The application allows users to build a tour of points of interest by entering data into a form and selecting GPS coordinates from a Google maps widget. Cruz and Leisner hoped that this tool would make it easy for professors to create assignments where students could collaboratively create their own augmented reality tours. Cruz introduces the idea in this archival blog post, and Leisner talks about it again here. A few months later, Dr. Joan Neuberger and a group of graduate students were writing a history of the 1966 tower shooting, and thought the project would benefit from an additional digital component in their Digital Public History seminar. Dr. Neuberger and her students thought it would be great if her class could make an augmented reality tour of the tower shooting. Enter the DWRL and Raugmenter. 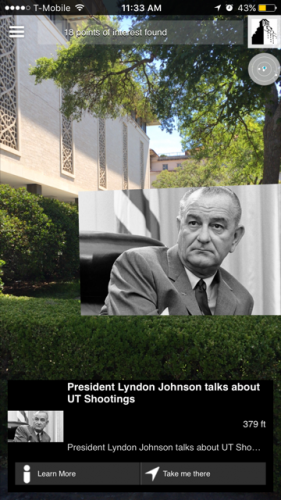 The class used Raugmenter as a platform that helps build an answer many of those questions, with an augmented reality tour of the 1966 shooting that provides relevant historical information as you walk around various locations on campus. The image below is a screenshot of the augmented reality interface in LayAR using UT Tower Tour during the initial beta testing. Depending on where you stand on campus, the screen will populate a cell phone’s screen with images and history as is relevant to where you are standing. While augmented reality apps are now plentiful, the LayAR platform is intended mostly for developers and requires a lot of guesswork in order to make Raugmenter accessible to people with minimal programming skills. LayAR provided all the functionality necessary for creating an augmented reality environment, but generating the content required several technical tasks, notably, creating a PHP script that responds to the app’s requests for information, and a database with all the information regarding the points of interest, from which the PHP script queries its data. LayAR provides the user with an app, available for iOS and Android, on which the content can be viewed, but creating the content is up to the developer. Because it is so bare bones, LayAR is both difficult to build on ( from a development standpoint) and allows a lot of opportunity for creativity. Dr. Cruz programmed Raugmenter so that images are automatically scaled down when the image URL is entered in the designated field and they do not become too much of an intrusion on the experience of the mobile tour, as above. 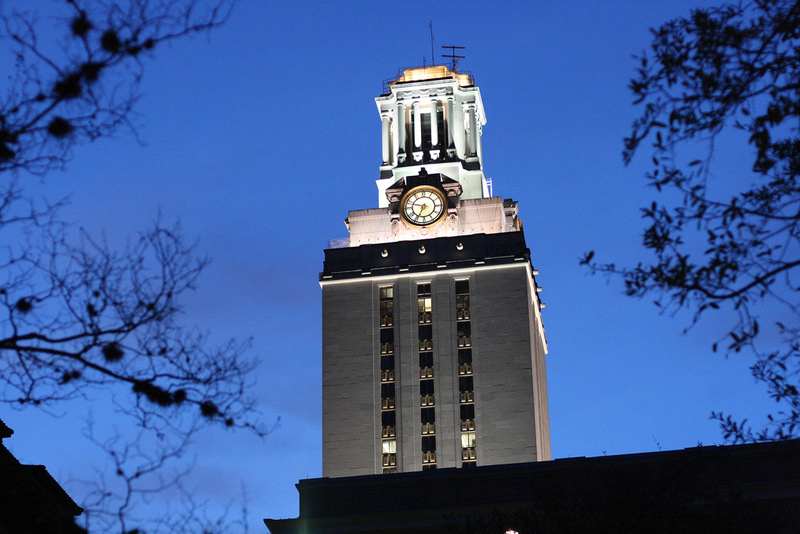 While the app is still in beta testing, the class has come up with a website that showcases their research and provides a wealth of information about the tower shooting, which had a somber anniversary on August 1 this year, the same day campus carry legislation was implemented. We at the DWRL can attest that this app is really quite cool, and will be available to a wider audience late this year. We’ll post an update when that happens, but for now, check out behindthetower.org.